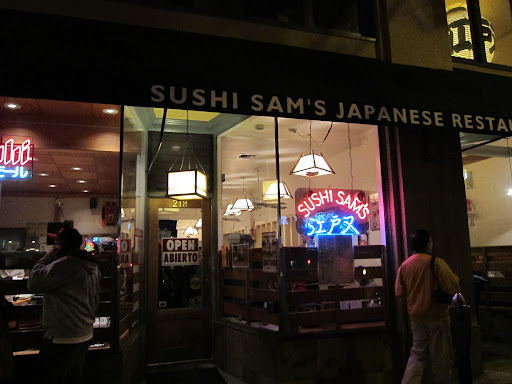 I was really excited to try Sushi Sam's since I had been meaning to come here for a while, but never wanted to wait. I suggest coming here before 6:30 to avoid the crowds, especially if you want to sit at the bar. 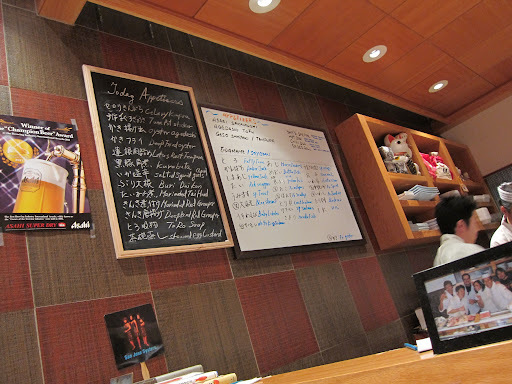 I'm a huge fan of the white board in sushi restaurants, which usually displays the daily fish specials. I ordered almost all the sushi exclusively from this board. Baby Lobster. 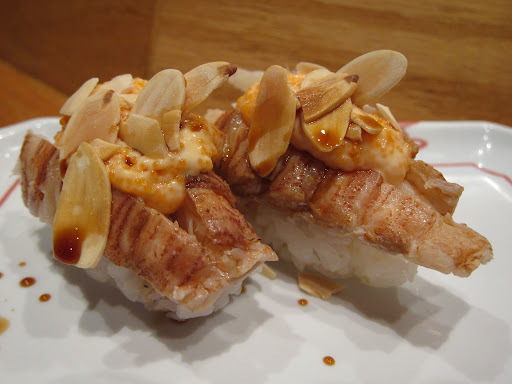 Topped with sliced almonds and stuffed with a mix of spicy mayo and tobiko. My first time having baby lobster sushi. I was expecting something sweet and tender, but the meat was firm. Fresh scallop. I ordered this scallop from the white board so I'm not sure if I had ordered the regular scallop it would have come unseasoned. 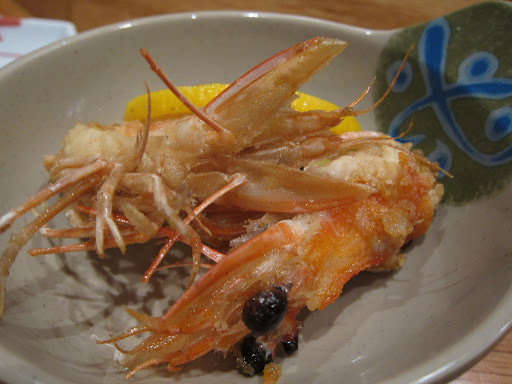 This one was prepared with yuzu and soy sauce. 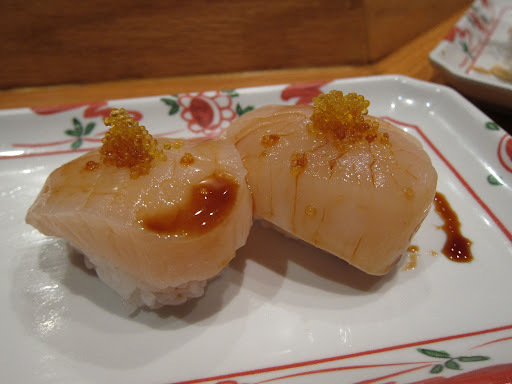 I was a little disappointed because I enjoy the sweetness of scallops and the sauce seemed to overpower that. Special salmon. Lightly seared with a dollap of grated daikon. Lacked that deep fatty and salty taste of salmon. 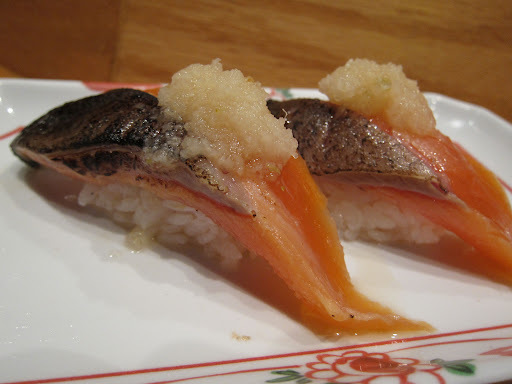 A little disappointing since sake (salmon) is one of my favorite sushis. Fresh blue shrimp. I never had this before and the shrimp was definitely a light tint of blue. 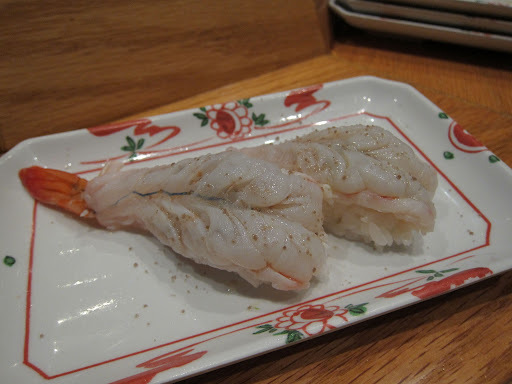 The texture was more chewy than any other shrimp sushi I've had. Not sure if that's how it was supposed to be. Freshly fried shrimp heads. A proper sushi spot gives you the shrimp heads if you order any shrimp sushi. Probably some of the better shrimp heads I've had. Fresh octopus. 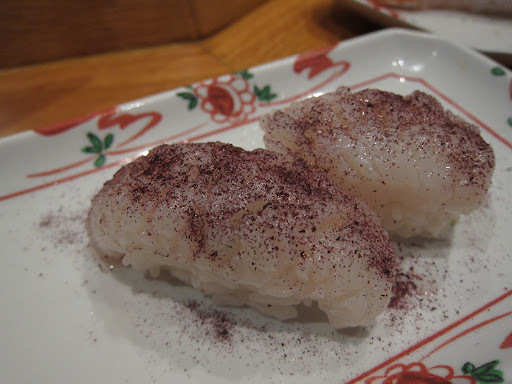 Lightly chewy and dusted with way too much ume powder. Ume is a Japanese sour plum. All I could taste was ume. 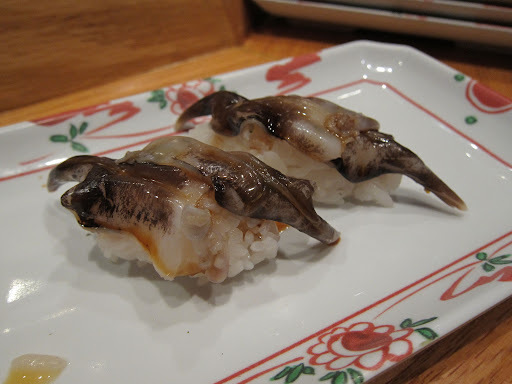 Agedashi oysters. Came with four small oysters. A lot better than I expected. White king salmon. Again, hard to taste the fish because the sauce put onto was a sesame oil and soy sauce blend. Kurabota. 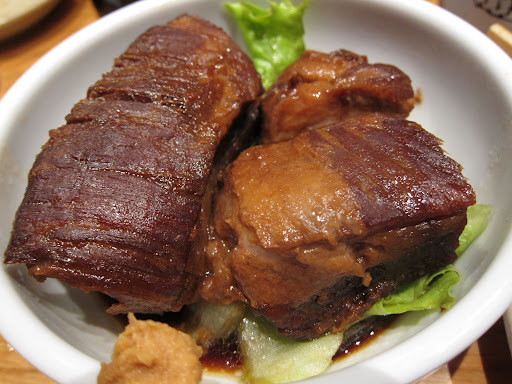 Braised pork. This dish was pretty average for me. I've had it multiple times before at other restaurants. While it was decent here, I've had better where the meat just falls apart with an ever so gentle tug of a chopstick. Chawan mushi. 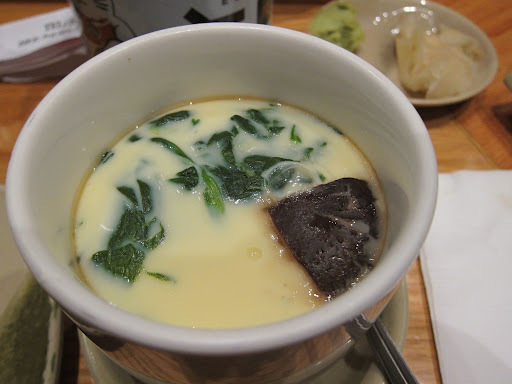 This Japanese steamed egg custard is one of my standard orders when I see it on the menu, but unfortunately this one was overcooked. 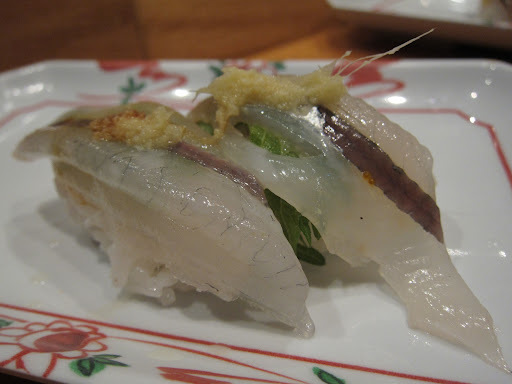 Butterfish sushi. This fish should be light and buttery tasting, but I couldn't taste it because there was too much yuzu soy sauce on it. 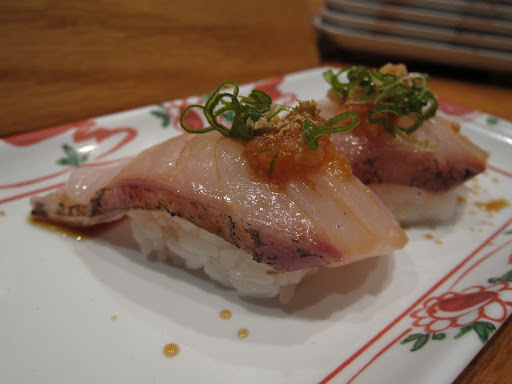 Miso cod sushi. First time I've ever seen miso cod as a sushi. Usually it comes as a hot dish. 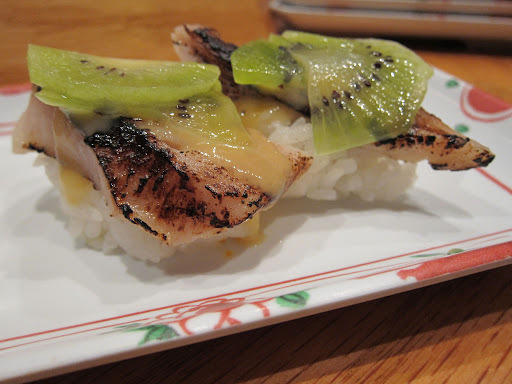 This cod was lightly seared with miso dressing and topped with a kiwi. I'm not sure what was going on with the kiwi or what it added to it, flavor wise. Not a big fan of this. Needlefish. 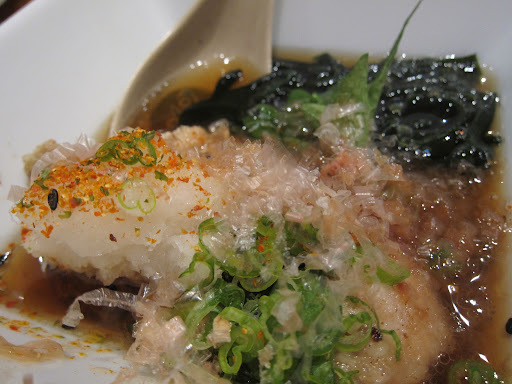 A very mild light flavored fish with a leaf of peppery shiso layered under it. Lotus root tempura. This dish came out totally different than I had expected. I was picturing thinly sliced lotus root in tempura batter. Instead, it was a slice of lotus root stuffed with minced pork. The tempura batter was too thick and greasy, but I did like the extra crunch the lotus root gave. 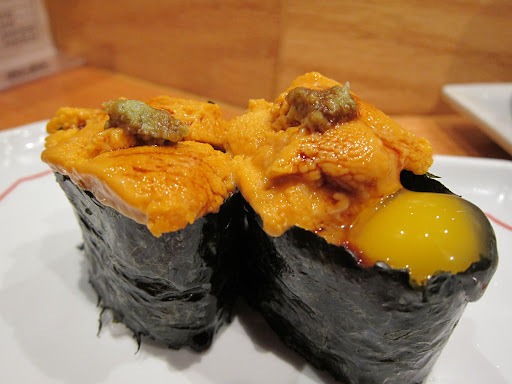 Fresh uni with tama (quail egg). I decided to order one with a quail egg and one without so I could taste both. A good sign of a sushi restaurant is their uni. 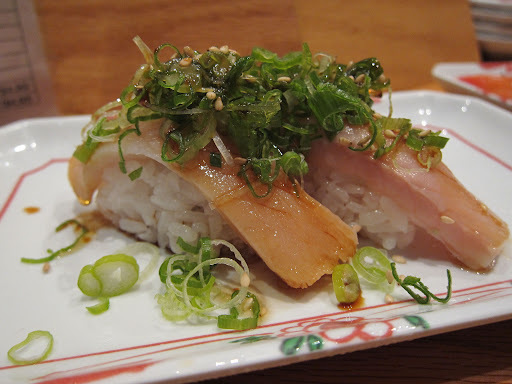 It should never taste like ammonia which is SO common in most sushi spots. Uni should be creamy like custard and slightly sweet. Sushi Sam's passed the test. 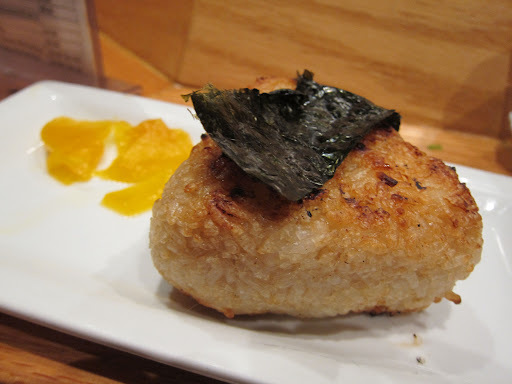 Yaki onigiri. 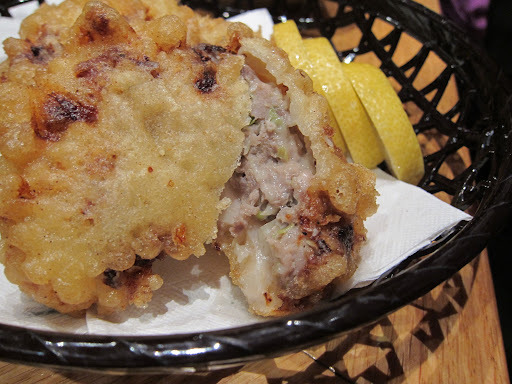 Lightly grilled rice ball. This is a must order for me when I eat sushi or at an izakaya. I liked how the soy sauce was mixed into the rice instead of just brushed on the outside of the rice ball. It could have been grilled a little longer for some more crunch. Overall, I really wanted to love this place, but I left pretty disappointed. This place has such a huge following for their sushi and I just couldn't figure out what was so great. Most of the fish seemed exciting, but the flavors were overpowered by the special sauces.